The South Orkney Islands were discovered in 1821 by two sealers, the American Nathaniel Brown Palmer and the British George Powell. The Islands were originally named Powell's Group, with the main island named Coronation Island as it was the year of the coronation of King George IV. In 1823, James Weddell visited the Islands, gave the archipelago its present name (after the Orkney Islands, Scotland) and also renamed some of the islands. The South Orkney Islands are located at roughly the same latitude south as the Orkney Islands are north (60°S vs 59°N), although it is not known if this was a factor behind the naming of the islands. Subsequently, the islands were frequently visited by sealers and whalers, but no thorough survey was done until the expedition of William Speirs Bruce on the Scotia in 1903, which overwintered at Laurie Island. Bruce surveyed the islands, reverted some of Weddell's name changes, and established a meteorological station, which was sold to the Argentine Government upon his departure in 1904. This base, renamed Orcadas in 1951, is still in operation today[update] and is thus the oldest research station continuously staffed in the Antarctic. A 1944 stamp of the Falkland Islands overprinted for use in the South Orkneys. In 1908, the United Kingdom declared sovereignty over various Antarctic and South American territories "to the south of the 50th parallel of south latitude, and lying between the 20th and the 80th degrees of west longitude", including the South Orkney Islands. 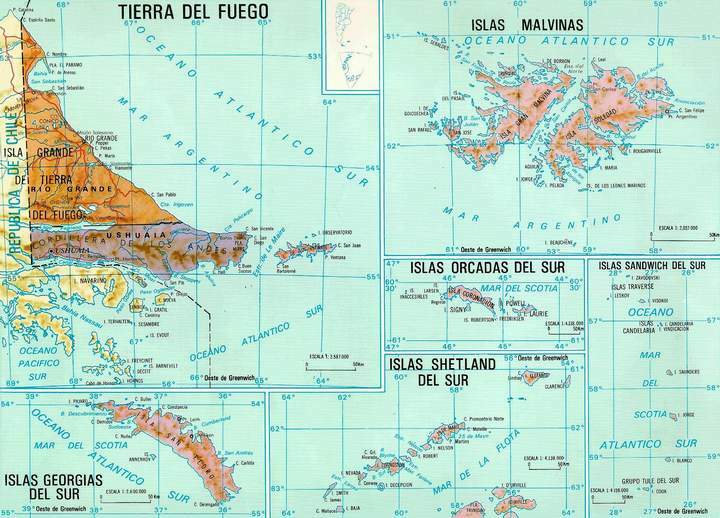 The Islands were subsequently administered as part of the Falkland Islands Dependencies. A biological research station on Signy Island was built in 1947 by the British Antarctic Survey, and was staffed year-round until 1996, when the Station staffing was reduced to 8-10 personnel who remained only during the southern hemisphere summer (November to April each year). In 1962, the islands became part of the newly established British Antarctic Territory. The Argentine claim to the islands dates from 1925. It was originally justified by the Argentine occupation of the Laurie Island base and later subsumed into a wider territorial claim. The islands are situated at latitudes about 60°30' to 60°48' S and longitudes 44°25' to 46°43' W in the Southern Ocean. As a group of islands, the South Orkney Islands are at approximately 60°35′S 045°30′W﻿ / ﻿60.583°S 45.500°W﻿ / -60.583; -45.500. The archipelago comprises four main islands. Coronation Island is the largest, measuring about 30 miles (48 km) long; its highest point is Mount Nivea which rises to 4,153 feet (1,266 m) above sea level. Laurie Island is the easternmost of the islands. The other main islands are Powell and Signy. Smaller islands in the group include Robertson Islands, the Saddle Islands, and Acuña Island. The total area of the archipelago is about 240 square miles (620 km2), of which about 90 percent is glaciated. The Inaccessible Islands about 15 nmi (17 mi; 28 km) to the west are considered part of the South Orkneys. The climate of the South Orkneys is generally cold, wet, and windy. Summers are short and cold (December to March) when the average temperatures reach about 3.5 °C (38.3 °F) and fall to about −12.8 °C (9 °F) in July. The all time temperature range is between 12 and −44 °C (53.6 and −47.2 °F). The seas around the islands are ice-covered from late April to November. South Orkney Trough (60°0′S 45°0′W﻿ / ﻿60.000°S 45.000°W﻿ / -60.000; -45.000) is an undersea trough named in association with the South Orkney Islands and approved 10/77 (ACUF 177). Despite the harsh conditions the islands do support vegetation and are part of the Scotia Sea Islands tundra ecoregion, along with South Georgia and the South Sandwich Islands, the South Shetland Islands and Bouvet Island. All these islands lie in the cold seas below the Antarctic convergence. These areas support tundra vegetation consisting of mosses, lichens and algae, while seabirds, penguins and seals feed in the surrounding waters. The littoral zone of the South Orkneys is biologically either lifeless or very poor. Amphipods and planarians exist under rocks, along with various algaes, chitons, and some gastropods. With increasing water depth, life becomes more varied: starfish appear beyond 2-3 meters along with sponges, urchins, and ascidians. At 8-10 meters the variety of starfish increases along with the general biomass, and below 30 meters there are vast colonies of these creatures. Two penguin species, Chinstrap (Pygoscelis antarctica) and Adélie (Pygoscelis adeliae), are present on land. The two claimant nations maintain research stations on the islands. ^ Maurice Schwartz (8 November 2006). Encyclopedia of Coastal Science. Springer Science & Business Media. p. 87. ISBN 978-1-4020-3880-8. Wikimedia Commons has media related to South Orkney Islands. Wikivoyage has a travel guide for South Orkney Islands.